Charge QC3.0 compatible devices 4 times faster with Qualcomm Quick Charge 3.0 Technology than conventional charger. Charge Quick Charge 1.0, 2.0, 3.0, USB C and all standard USB powered devices at their full speed. Compatible with Type-C devices: Samsung Galaxy S9 / S9 Plus, Note 8, Samsung Galaxy S8 / S8 Plus, LG G6 / G5, Google Pixel / Pixel XL, Nexus 6P / 5X, OnePlus 5/ 3T / 3 / 2, Moto Z / Z Play / Z Force / Z2 Play, Sony Xperia XZ / XZS / XZ Premium / XA1 Ultra, Huawei P10 / P10 Plus, Honor 9 / 8, Nintendo Switch, 2015 Google Chromebook Pixel and more. 4-In-1 CHARGER KIT: The S9 / S9 Plus / S8 / S8 Plus / Note 8 fast charger kit includes one car charger, one wall charger and two pack USB type-c cables, which allow you to charge your devices freely at home or during travel. 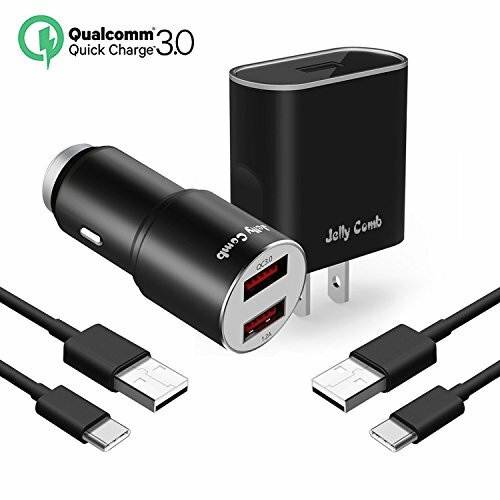 QUICK CHARGE 3.0 TECHNOLOGY: The car charger and wall charger each has one Quick Charge 3.0 USB port, which can charge your QC3.0 compatible devices up to 4x faster than traditional chargers. The bottom smart charging USB port on the car charger can charge your devices at maximum speed. COMPATIBLE DEVICES: Work with Samsung Galaxy S9 / S9 Plus, Note 8, S8, S8 Plus, LG G6/ G5, HTC 10, Lumia 950xl / 950, Nokia 8, Google Pixel / Pixel XL, Nexus 6P / 5X and all other standard USB devices. DURABLE TYPE-C CABLES: Made of high quality material, charge faster than most standard cables and super speed data transfer rate. SAFETY GUARANTEE: Built-in over-current, over-charging, over-voltage and short-circuit protection will make the charging process safely without any risk of overheating or damaging your devices.